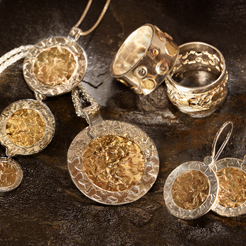 The silver and gold jewels from Rachel Art Jewelry, designed by Rachel Eshkol, are made from 925 silver and 9k gold, and set with semi-precious stones and pearls. The combination of these two materials - silver and gold - introduces an added play of color to the jewelry, enriching the design and enabling emphasis of chosen design elements by highlighting them with gold. The raw material undergoes a unique processing technique to obtain a range of textures, while the setting of semi-precious stones adds extra color and texture to the richness of design. The silver jewelry with a touch of gold is imbued with the look of ancient jewelry craftsmanship while the design harmoniously reconciles the contradictions between ancient and modern, East and West.